Turt, a sub-adult male green sea turtle, was found floating in the intake canal of the Nuclear Power Plant in Fort Pierce in 2009. Unfortunately, that wasn't the first time he needed help. Turt was found with an internal pit tag that told a story of at least four other occurrences when humans had to step in to provide him aid. Concerned by the number of times the turtle had been scanned, the rescuers took him to Loggerhead Marinelife Turtle Hospital in Juno Beach with the hope that the doctors there would be able to determine what was causing this turtle so much turmoil. 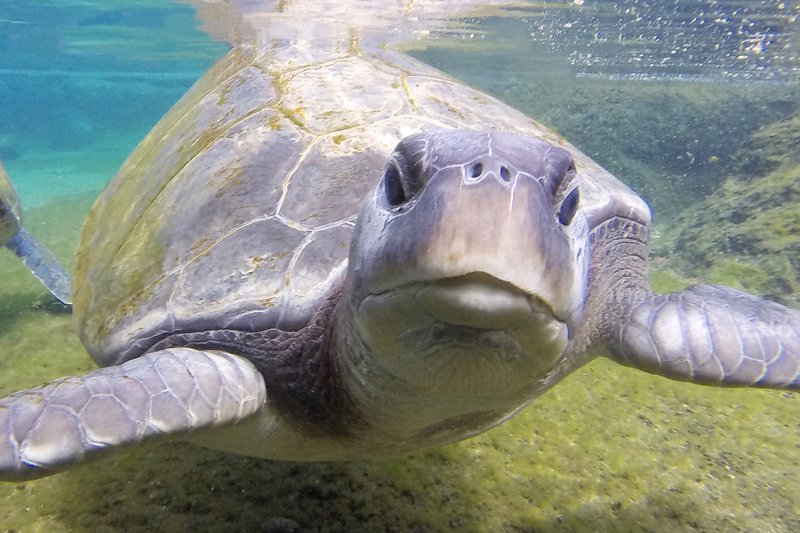 After undergoing a series of tests at the hospital, Turt was diagnosed with spastic peristalsis of his large intestines, meaning he would need to be on medication to control his buoyancy for the rest of his life. Since the medicine needed to be administered every other day, Turt needed to be transferred to a non-releasable facility for permanent care. Turt arrived at Florida Oceanographic on July 23, 2010, making him the first sea turtle to call the Game Fish Lagoon home. For feeding and medicine dispersal, he is operant trained to respond to a blue circular target. 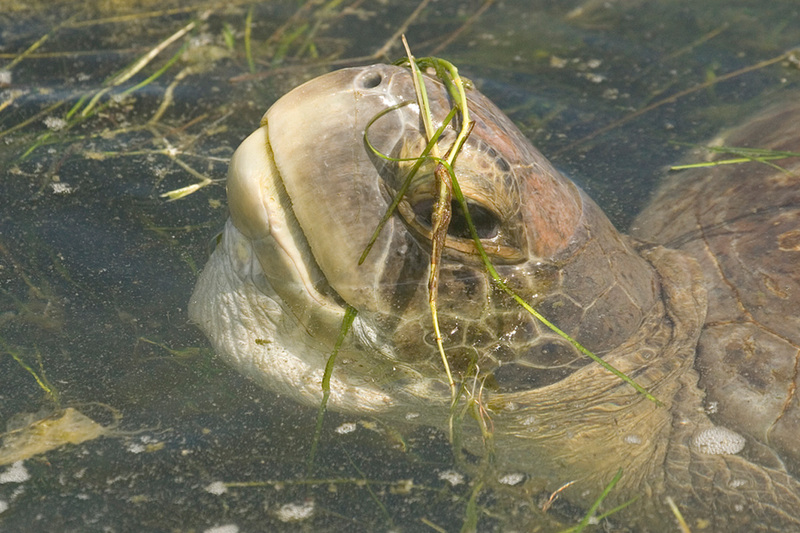 Turt also enjoys lettuce donated by Publix or can be found foraging on the algae growth in the Lagoon. Lily, our sub-adult loggerhead sea turtle, was originally found in 2008 floating off the coast of No Name Key. After being taken to Marathon Turtle Hospital, it was evident by the deep scars in his carapace that Lily was the victim of a boat strike. During 2 years of rehab, the doctors determined that the damage affected his ability to control buoyancy so Lily would need to be fitted with weights and sent to a “non-releasable” facility for permanent care. On December 6, 2010, Lily was transferred to Florida Oceanographic to call the 750,000-gallon Game Fish Lagoon home. When Lily first arrived, gender was not yet determined. However, over the last couple years, Lily, who is getting closer to adult size, has grown both in weight (almost 100lbs) and tail length. The long tail is a sign of a maturing male, so despite the name, and beautiful eyes, Lily is a boy. Lily is our largest resident and only loggerhead. Like the others, he is operant trained for feeding and responses to a triangular orange target. To offset his buoyancy issue, there are 3 stainless steel bolts epoxied to the back of his carapace. Hank is a juvenile green sea turtle that was found in March 2010 "cold stunned”, lethargic and covered in barnacles. Hank was taken to Mote Marine Laboratory in Sarasota where is was determined that there was a buoyancy issue that would require long term "non-releasable" care. So in November 2010, Hank was transferred to Florida Oceanographic and resides in the shallow water turtle pool of the Game Fish Lagoon. Hank, who is under 100 lbs, can be found hanging out in the turtle pool area. During feeding sessions, Hank practices operant training with a green square target. Anna Belle is a sub-adult male green sea turtle that was transferred to Florida Oceanographic on July 25, 2012, from Loggerhead Marinelife Center, where he had undergone rehabilitation since December 2011. Anna Belle, like the other residents, has a buoyancy problem, but unfortunately has not found the right treatment to help offset it. Therefore, Anna Belle can be found in the shallow water turtle pool of the Game Fish Lagoon until the issue is resolved. During the day, Anna Belle can be found resting or foraging on the algae growth in the tank. During feeding sessions, he responds to a purple square target to receive a diet of fish and squid.